Made by: possibly George Adams Jr. Microscope No. 233 is a compound microscope mounted on a simple oak block. The microscope construction is of the Cuff style with a single support pillar, Hevelius screw focus and simple optics. The cross-shaped stage, fixed to the pillar with two coarse machine screws, has two slotted cutouts for accessories and a recessed central hole. A scooped mount underneath the stage held a glass sample phial. Springs to support the phial are missing. The base has a hole for the illuminating mirror; which is also missing. The microscope body press-fits into a cantilevered support arm. Microscope optics, standard for the time, consist of three biconvex single lenses: eye, field, and objective lenses. There is only one objective with this instrument. It is engraved with a "4". The downtube is engraved with Lieberkuhn positions (2-5). George Adams Jr. is known to have made direct Cuff copies (such as this one) as well as modified Cuff-type instruments prior to his invention of the Universal microscope. 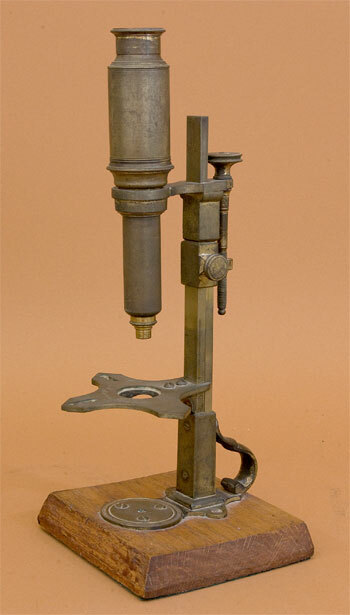 The crude nature of this instrument, the "Adams" signature, and its nearly identical construction to the original Cuff microscope suggests this instrument was made in the early era of the George Adams Jr. workshop. There are several clues that suggest this: The quality of the signature and downtube engravings are not typical of George Adams Jr. The downtube itself is extremely thick brass (3mm); which is uncharacteristic of later instruments from the Adams shop. The workmanship is of a poorer quality than is typical of Adams' later instruments (see No. 6 and No. 17)this includes the poorly cast support ornament, the large, crude machine screws found throughout the instrument, and hand-engraved Lieberkuhn position marks on the downtube. The microscope is approximately 26cm tall. There is no storage box and no accessories with this instrument.